Forgetting to book your travel insurance before you leave home it more common than you think. In the rush to get ready for a holiday, you think you have covered all the bases and then having cleared customs, picked up your bags and are making your way to your destination, someone mentions travel insurance and you think "Nooooo!" but don't worry we can help. We have policies that will provide full cover with no exclusions commencing the day after you purchased the travel insurance policy. This caveat is for obvious reasons and is designed to stop people insuring only once they have had an incident or injured themselves and require immediate assistance. Austria, Belgium, Bulgaria, Croatia, Cyprus, Czech Republic, Denmark, Estonia, Finland, France, Germany, Greece, Hungary, Iceland, Ireland, Italy, Latvia, Liechtenstein, Lithuania, Luxembourg, Malta, Netherlands, Norway, Poland, Portugal, Romania, Slovakia, Slovenia, Spain, Sweden, United Kingdom. The policies are sold under the basis that you are registered with a doctor in your home country. All policy wordings will be in English and Claims will be settled in pounds sterling. 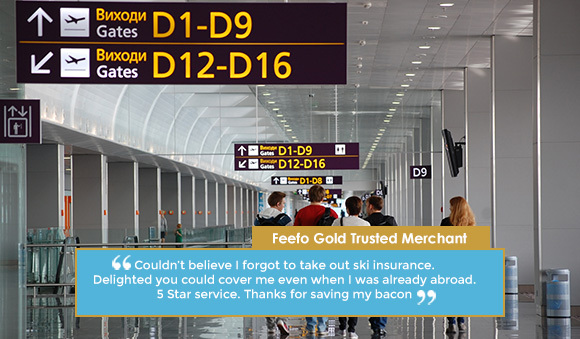 The maximum duration we can cover you for is 31 days skiing and that will include any days that you have skied prior to booking this insurance. So if you have been away 2 days the maximum days we can is 29 days, by which time you must have returned to the UK. Now the case above is for those who travelled and are taking out a policy within 7 days of leaving their home country in the EEA, however if you have been abroad more than 7 days or if you are abroad and have a policy that has expired and you need extend the cover then we too can help. If you are looking for travel insurance we can now cover you if you live in any of the following countries as a native or have residency. Travel insurance is not a substitute for taking out a private medical insurance policy. The policies are sold under the basis that you are registered with a doctor in your home country and that all trips will start and end at your home. All prices will be in pounds sterling, the policy wordings will be in English and Claims will be settled in pounds sterling. Please note that the "already abroad" options are only available for ski trips up to 31 days in duration. Any ski trip longer than 31 days cannot be booked online. Policies are available via our call centre on 0330 880 5099 subject to terms and conditions. Comprehensive travel insurance for EU residents covers the policyholder for insurable events that may occur before or during travel, such as trip cancellation or journey interruption, medical expenses for injury or illness, theft of valuables, baggage damage and more. The cost of travel insurance is based on the type of cover requested, the age of the insured, the destination of travel, length of stay, type of activities covered and whether you have any pre-existing medical conditions. As a company we use a number of insurers and they each have different approaches to medical screening. In the main their approaches have improved and we have amongst our stable of product, insurers who will cover in excess of a 1,000 medical conditions. It is important to remember that the EHIC is for emergency hospital visits only and will not entitle you to any other form of treatment. It will also not cover the cost of emergency repatriation to the UK if needed and will not pay for any of the other benefits associated with a travel insurance policy including baggage, cancellation personal liability cover etc. To find out more about the European Health Insurance Card, please click here. (2) Cover limited to the Standard, Premier, Premier+, Voyager and Voyager+ single trip and annual multi trip travel insurance policies. Photo: Vladimir Yaitskiy Under licence.